I knew the first model Kinetic chronograph was rare, in fact they commanded a premium when new. However I did not know how rare they actually are; in conversation with Seiko UK people today they mentioned that they get two shipments per year of this watch, each shipment is 14 watches. Yes you read that right, the UK a major market for Seiko watches gets 28 per year. Think about it, that makes them MUCH rarer than a Stainless Steel Daytona!! I got the background as to why Seiko do not sell the high price product (e.g. Credor/Grand Seiko) outside Japan, in the late 1970s Seiko bought a Swiss brand named Jean LaSalle; they made the world’s thinnest mechanical & automatic watches at the time. 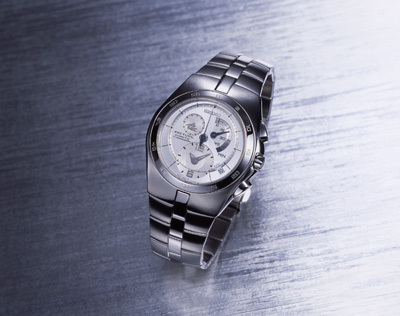 Seiko’s intention was to have the LaSalle brand as their high-end brand in Europe & the US. They applied this name to a range of quartz watches that (if I remember correctly) were quite unexceptional, other than their high price. When this plan failed, Seiko read the lesson as “never try to sell high priced product to the occidentals”; instead of the real lesson, which was “never try and sell high priced crappy watches to the occidentals”. The new Kinetic Arctura chronographs which will sell for around 900€/$US and will be widely available are the first attempt by Seiko to retain some of the high ground. 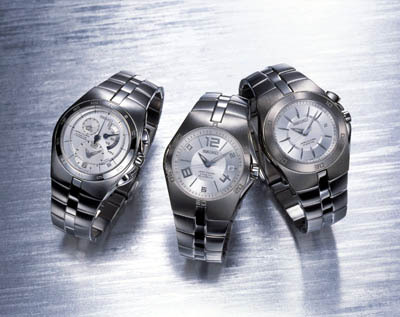 And, in some way, can be seen as the “pathfinders” for the Credor and Grand Seiko ranges to be introduced outside Japan. This shows the new Kinetic chronograph, with the hour & minute hands in a small sector towards the bottom of the watch and the running seconds at the 10 position. All these hands are in polished steel whilst the sweep seconds counter & the 45 min register both have blued steel hands; the watch is waterproof to 100m.